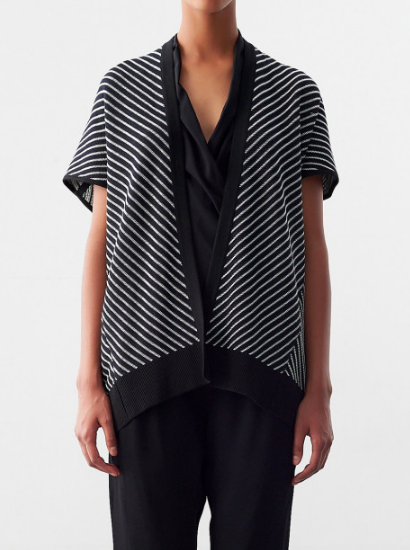 I haven’t done one of these posts in a while because I really have been trying not to buy much, but I found the siren song of the Zero+Maria Cornejo sale to be irresistible, and picked up this short-sleeved cardigan that I wear even as I type. I was recently accused of having very basic taste in earrings, because I always wear the same old small hoops, day after day. 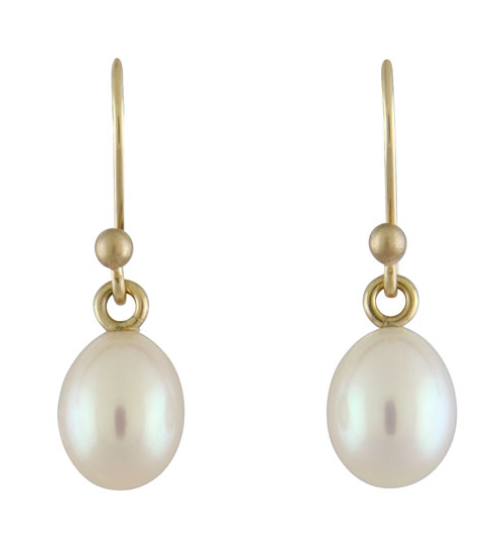 So I’m thinking I might mix things up a bit, and these pearl earrings from Ted Meuhling are just so elegant. This tote packs down to nothing, and is perfect if you’re the type of person who acquires too much when she travels to fit it all in her suitcase. Just a really chic little faux fur jacket at a decent price. This is a pretty simple top, but I like how it’s sort of peasant-y without being at all hippie-ish. This zebra-stripe cashmere sweater pleases the part of me that knows I peaked, style-wise, some time in the 80s. 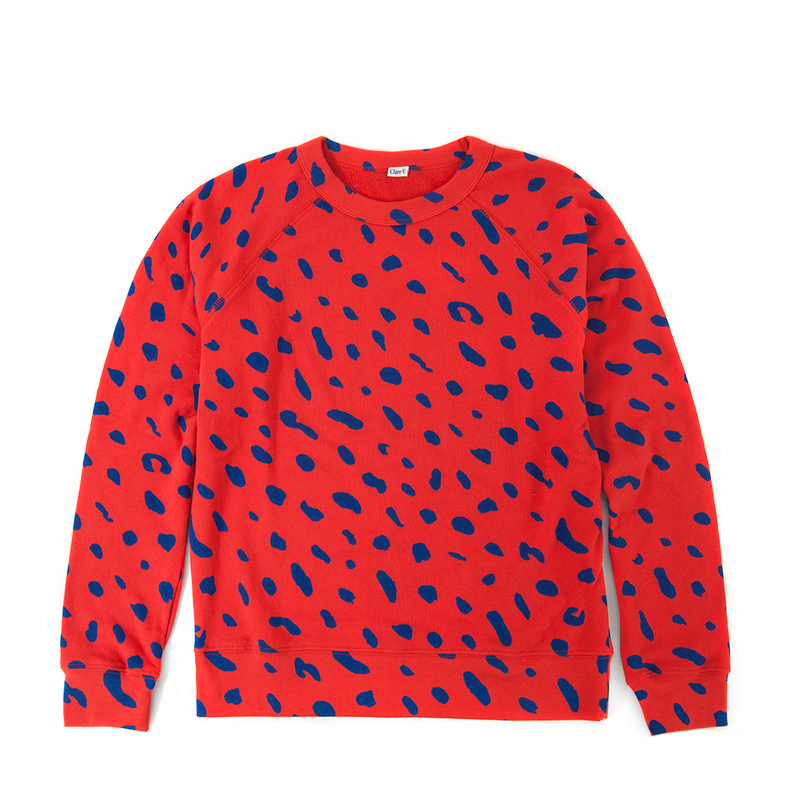 Just a cute jaguar-print sweatshirt for lounging about. I wear my black No.6 clog boots constantly, and they are currently looking quite beaten up in that way that even a trip to the shoe repair can’t fix. So I’m thinking of replacing them, but with this navy pair. Thoughts? Re the No. 6, do the navy! I retired a pair of shearling ones in brown aviator last year (after 8 years of wear!) and have been feeling the lack in my closet ever since. I’ve been eyeing the navy shearling and somehow to me it just feels a little fresher than the black. Love the string tie peasant/not hippie blouse, but those strings would be in my soup, my coffee, my toothpaste etc. etc. etc. 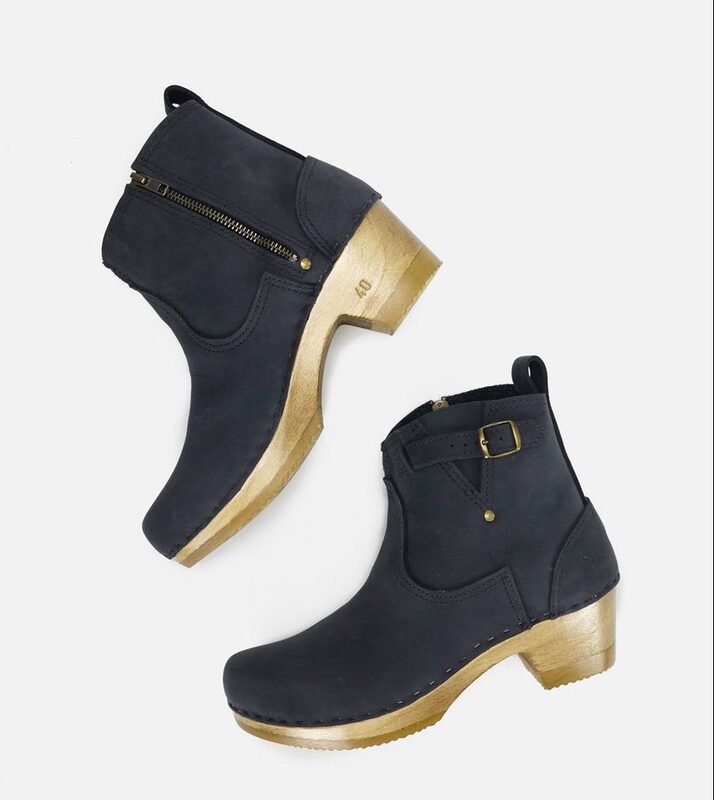 Yes to the No.6 Navy clogs. I can’t “do” pearls because Barbara Bush ruined them for me, but if I could I think those earrings are lovely. Love the string tie peasant/not hippie blouse, but those strings would be in my soup, my coffee, my toothpaste etc. etc. etc. Yes to the No.6 Navy clogs. I can't "do" pearls because Barbara Bush ruined them for me, but if I could I think those earrings are lovely. That faux fur is terrific- I’ve never seen such a good one, and it seems ethically made and US/NYC made. Dammit I am tempted! Just wanted to let you know that I purchased my first pair of No 6 clog boots in black because of you! After reading your posts for a couple of years praising these boots, I went for it and I am thrilled with them! Thanks for pointing out timeless quality design and not just hyping the latest trends. I like the clog boots. Got for it. Sorry: that was “GO” for it. I like the navy boots a lot. I have the same pair in brown that I wear to death, but they are definitely “rustic” looking. I think the navy is much more spiffy and it’s dark enough to be very neutral. I like the navy boots a lot. I have the same pair in brown that I wear to death, but they are definitely "rustic" looking. I think the navy is much more spiffy and it's dark enough to be very neutral. Oops, did not mean my other comment to go to you! I will say that, as far as sizing goes, No. 6 plays by its own rules. I’m usually a 39 in most brands and wear a 41 in No. 6. If you have a high instep at all, some styles just won’t work period, in my unfortunate experience. Oops, did not mean my other comment to go to you! I will say that, as far as sizing goes, No. 6 plays by its own rules. I'm usually a 39 in most brands and wear a 41 in No. 6. If you have a high instep at all, some styles just won't work period, in my unfortunate experience. In my personal experience, I just have to go up one size at No. 6, and that’s pretty consistent across purchases. But I know you and others have had different experiences, so go figure. In my personal experience, I just have to go up one size at No. 6, and that's pretty consistent across purchases. But I know you and others have had different experiences, so go figure. Thank you for this Kim & Sarah Jones, I’ve been so tempted to order, but was concerned about size. Also one of those folks with a high arch––and super bony top of my foot––ergo many boots simply won’t fit. Cowboy boots are the worst! Thank you for this Kim & Sarah Jones, I've been so tempted to order, but was concerned about size. Also one of those folks with a high arch––and super bony top of my foot––ergo many boots simply won't fit. Cowboy boots are the worst! I found the sizing to be fine. I have two pairs and I adore them! You should get in touch with no.6 about sizing. I have a few different pairs and wear a slightly different size in each model. I have 38s and 39s. My 39s in shearling are a bit too small, but the 39s in the other models are a bit too big. I wish I had taken the time to talk to them before just ordering. I do not understand what a short sleeved cardigan is for – or a short sleeved sweater if I’m completely honest. If I’m cold enough to need a sweater for my torso; my arms would be too cold for short sleeves. Are you just hot natured? I do not understand what a short sleeved cardigan is for - or a short sleeved sweater if I'm completely honest. If I'm cold enough to need a sweater for my torso; my arms would be too cold for short sleeves. Are you just hot natured? It’s all in the layering, Amy. It's all in the layering, Amy. 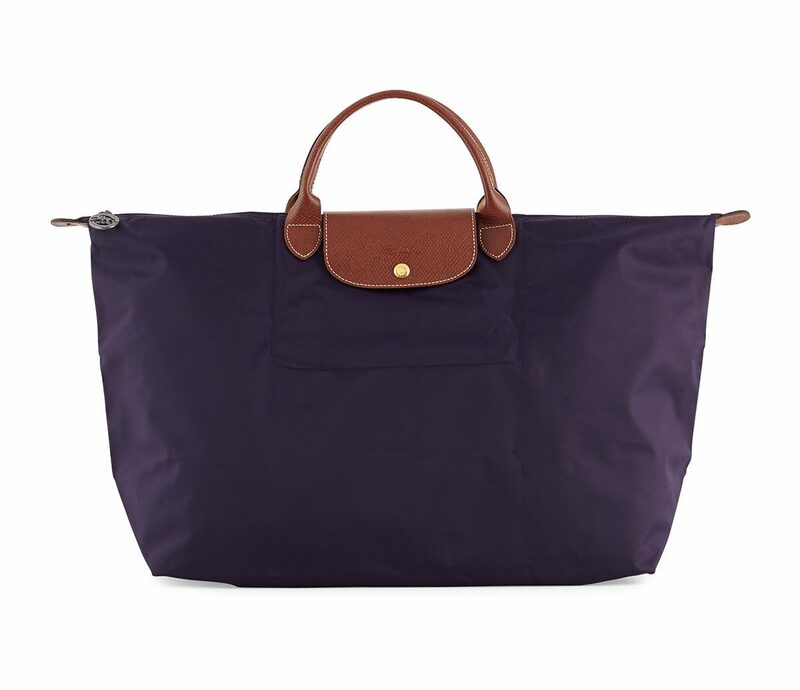 My Longchamp has been a lifesaver when traveling, especially at French drug stores! I upgraded to the expandable. I just got the first pair of navy shoes probably since grade school and am in love- I can’t believe how much stuff they match. Also, I too wear 1″ hoops year-in and year-out, I sleep in them, I forget they are there. Sometimes I try to liven things up and it works for a bit, then I just wander back to my old comfortable hoops. I might need new comfortable hoops? I just got the first pair of navy shoes probably since grade school and am in love- I can't believe how much stuff they match. Also, I too wear 1" hoops year-in and year-out, I sleep in them, I forget they are there. Sometimes I try to liven things up and it works for a bit, then I just wander back to my old comfortable hoops. I might need new comfortable hoops? Has anyone tried Troentorpe clogs, specifically the boots? I have Troentorp clogs (though not boots). I found them at a clothing tag sale for $60 a few years ago and wear them endlessly. They’re heavy (those steel toes) but comfortable. I think I like them more than my Dansko’s. I’m happy to try to answer a specific question, if you have one. I have Troentorp clogs (though not boots). I found them at a clothing tag sale for $60 a few years ago and wear them endlessly. They're heavy (those steel toes) but comfortable. I think I like them more than my Dansko's. I'm happy to try to answer a specific question, if you have one. Super! How is the sizing compared to Dansko? Ok for high arches? Comfortable and light enough to walk around A LOT?! Are clogs better for high arches, or does it depend on the brand?